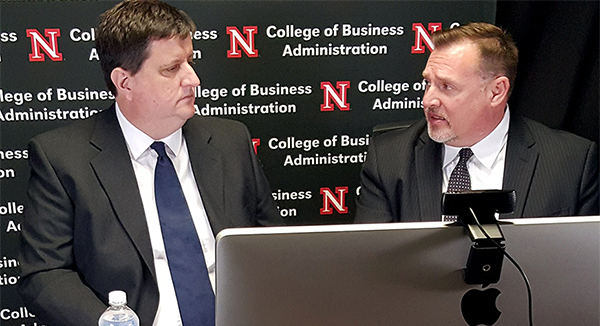 The Bureau of Business Research (BBR) at the University of Nebraska–Lincoln announced three webinars offered this fall which are free and open to the public. Dr. Eric Thompson, director of the BBR and Karl H. Nelson Associate Professor of Economics, leads the presentations, including discussion opportunities along the way. Attendees can register for one or multiple webinars at http://bbr.unl.edu. The three webinars include: “Changing Business Issues Over Six Years of Economic Recovery,” November 3; “Producer Services in Nebraska – Is the State Making Progress?” November 17; and “Nebraska Economic Forecast,” December 15. All webinars take place from noon-1 p.m. central time. “Changing Business Issues Over Six Years of Economic Recovery,” examines how concerns facing Nebraska business changed during the long-running economic recovery. The BBR surveys 500 Nebraska businesses each month since January of 2012, and asks owners and managers about their top business issue. They track how issues such as taxes, regulation, labor availability, customer demand and competition came to, and fell from, the forefront as economic conditions improved. The November webinar, “Producer Services in Nebraska – Is the State Making Progress?”, takes a look at the producer services industry to examine the fastest growing source of high wage jobs in the U.S. economy. This webinar examines whether Nebraska has been closing the gap in recent years in an area where the state usually lags behind the rest of the country. Finally, the “Nebraska Economic Forecast” webinar in December covers the newly-released economic outlook for Nebraska for 2018 and beyond. The forecast includes the outlook for farm income and non-farm employment, as well as expectations for key industries such as manufacturing, construction, health care, retail, finance and producer services. The webinar series is one of the bureau’s numerous outreach efforts to help people understand research relevant to businesses and families across the state. The BBR is housed in the Department of Economics in the College of Business. For more information or to register for the webinars, visit: http://bbr.unl.edu.